Kabir Abiodun Oluokun A.K.A. R Kay Bee (RKB) is what the streets have been demanding, he heard thier cries and has entered the musical arena in full force. Lagos born and bred but a native of Oyo State, RKB is the first born with 2 (two) younger siblings. His music career started 7 years ago and he has been honing his skills, building his fanbase and executing solid live performances ever since. On his latest visit to Nigeria gRock Records Intl. label boss Mr. Femi Olu (Sham Pain) saw the vigorous work ethic of R Kay Bee and made him audition for him later that evening, the label boss was blown away by the vocal rendition he made of his songs with his friend playing on the guitar acoustic style and signed him on the spot. This live acoustic rendition he performed is now the popular song 'KéLéLé', his first official single and the first to be released under his new label gRock Records Intl. Due to it's heavy penetration on the street, infectious vocals and monstrous beat it was heard by popular Fuji artist Walé Tékoma (Adewalé Ayindé Tékoma). After hearing, Tékoma quickly blessed the song with his signature fuji vocals to create a masterpiece body of work between the new and traditional music styles. 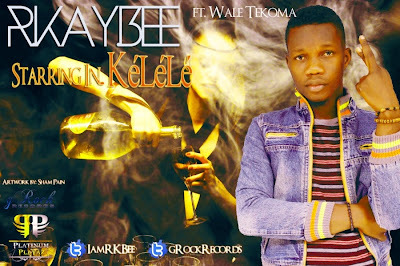 R Kay Bee is not just a singer.. he writes, composes and arranges all his own songs as well, so look out for R Kay Bee he is the one to watch in 2013 with more good music to come.